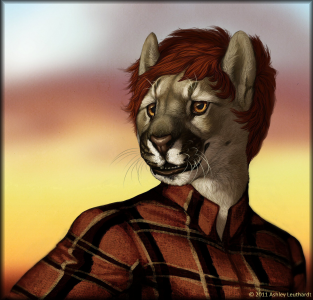 Jonathan Sunset is an anthropomorphic mountain lion from Ted R. Blasingame's 2011 science fiction novel, Sunset of Furmankind. The name originated in 2008 during preparation for working notes on the novel. The origin of this character's name is very loosely based upon the villain John Sunlight from the 1933-1959 pulp magazine series of Doc Savage, though Sunset bears no other resemblance to that fictional character. Coming Soon: commissioned art images and character information data.